Baitcasting reels offer distinctive advantages over other reels. The features that make it an indispensable tool to pro anglers are also the source of frustration for novice baitcasters. The reward of investing time into mastering baitcasting reels is preparedness to take advantage of every opportunity the sport may bring. Baitcasting reels come in left and right-handed versions. Anti-reverse gear, brakes, drag systems, level wind, and gear ratios, are some of the features that make it the best choice for accurate casting and breaking the fight of feisty game fish without breaking the rod. Baitcasting reels are mounted on top of rods allowing the line to be pulled off the spool by the weight of the lure, and not by the force behind the cast. The heavier the lure the more distance to be gained. For baitcasting a heavy artificial lure is used, but the weight of the lure (artificial or live weighted bait) should match the rod specifications for best distance and handling. An adjustable centrifugal, or magnetic, brake system controls how fast the spool spins and determines how fast the line is released during casting. Acing baitcasting braking systems 101 will prevent the dreaded backlash common amongst novices, and even strikes the pros. The thumb is still an important digit for championing baitcasting, but it may spend a lot more time gripping the backside of the reel instead. Baitcasting reels use a wide array of heavier lines from copolymer, fluorocarbon, and heavy Dacron wire. For lures that require a slow presentation, (i.e., jigs), the low gear ratios let you adjust how much line comes off the spool during casting. The ratio is the number of times the spool revolves during one turn of the handle. A 5:1 ratio is accepted as a good ratio for a novice fisherman. The brakes let you slow down, and stop, the spool when the bait hits the water controlling how far the lure drops. Another big advantage baitcasting reels have over other reels are how its features can be used in combination to handle hard running, and hard fighting game. They are the reels of choice for bass, muskie, striped bass and pike fisherman. The variable drag system lets anglers adjust the resistance on the spool in small increments by turning a star shaped knob sometimes referred to as star drag. During fights the drag setting lets line come off the spool smoothly without snapping it. Drag can be adjusted during use without twisting the line. Anti-reverse gear is another method of controlling the catch during cranking. Anti-reverse gear reduces play in the handle by preventing it from spinning backwards costing the fisherman to lose power during cranking. It reduces stress on the ball bearings during hard fights. The level wind feature evenly distributes line on the spool during winding so the angler does not have to manually guide the line. With proper guidance, practice, and patience, any fisherman can learn to use baitcasting reels like a professional. 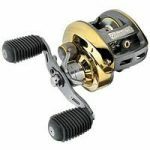 Other varieties of baitcasting reels like the flipping reels that let anglers cast underhand into tight spots are tools to consider for becoming a serious angler, and make baitcasting reels more interesting than any other on the market.